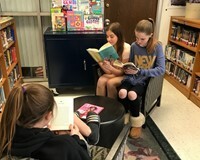 Welcome to the Commack Middle School Library Media Center! Staff: Library Media Specialist - Mrs. Hanley: Monday, Wednesday all day and Thursday after 1:15. District Lead Librarian - Mrs. Burton: Full-time; Part-time Library Support Staff: Mrs. Maina and Mrs. Rojas. Students may borrow one book for pleasure reading and one for research for three weeks, with an option to renew if needed. Students may obtain library passes to visit independently during lunch and ELO, subject to availability. Please pick up lunch and ELO passes at the library before 3rd period. Passwords are required for most databases and are available in the Library Media Center. Please contact us at 858-3520 with any questions or requests.